Nato countries have agreed to back US plans to site a missile defence system in Europe, at a summit in Romania. Member states will endorse a communiqué backing the plan to position missile defence bases in the Czech Republic and Poland, US officials said. Albania and Croatia were invited to join the 26-member alliance. But Georgia and Ukraine will not be put immediately on the path to membership, while Macedonia was told it must solve a dispute with Greece before joining. The communiqué on missile defence, circulated by US officials, acknowledges ballistic missile proliferation as "an increasing threat to allied forces, territory and populations". It says the US-led system will make a "substantial contribution to the protection of allies". The BBC's diplomatic correspondent, Jonathan Marcus, says that consensus on missile defence is a significant achievement for US President George W Bush, who wanted to get full Nato support for the project before he leaves office. The alliance had been deeply divided, amid strong Russian objections to the plan. The US says the system is needed to counter a potential threat from rogue states like Iran, but Moscow fears it could be used against Russia. The agreement emerged as US and Czech officials announced they had reached a deal to site a to base a missile defence radar on Czech soil, while Poland and the US resumed talks in Warsaw on locating 10 interceptor missiles in Poland. Nato has confirmed it will not yet offer membership to Georgia or Ukraine after the 26-member alliance was split on the issue. Nato Secretary General Jaap de Hoop Scheffer told a news conference Georgia and Ukraine would become members eventually, something Moscow described as a "huge strategic mistake". Germany and France had been opposed to putting the two former Soviet republics on the path to membership, amid concerns voiced by Russia over Nato's eastward expansion. Georgian diplomats said they were "not happy" with the delay but welcomed the promise of eventual membership. Nato officials said Macedonia could begin talks on joining the alliance as soon as it had resolved a dispute with Greece over its name. Macedonia's membership was strongly opposed by Greece, which has a northern province that is also called Macedonia. It argued that the former Yugoslav republic's insistence on being known as Macedonia implied a territorial claim. Macedonian officials said their rejection was a "huge disappointment" that would undermine stability in the Balkans, and said they would leave the three-day summit early. Our correspondent says the decisions on Georgia, Ukraine and Macedonia are setbacks for President Bush, who had been pushing for membership for all three countries. 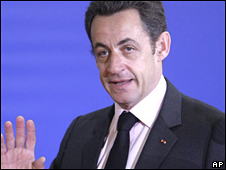 Separately, President Nicolas Sarkozy indicated France would decide next year whether to return to the Nato military command it left in 1966 in protest at the dominance of US commanders. He also said a battalion of extra French troops would be deployed to Afghanistan, easing fears of a crisis within the Western coalition there. The US says the French move, expected to involve up to 1,000 extra soldiers, will free up some of its troops to move to southern Afghanistan, where Canada had demanded Nato reinforcements be sent. Canada's parliament voted last month to extend its military mission in volatile southern Afghanistan to 2011 - but only if its allies sent reinforcements.